Yes I am part of the #nutbutteraddict club, and I'M NOT AFRAID TO ADMIT IT! I have a problem. Is there a nut butters anonymous out there anywhere? I gotta get on that STAT. Ahh back to the cups! 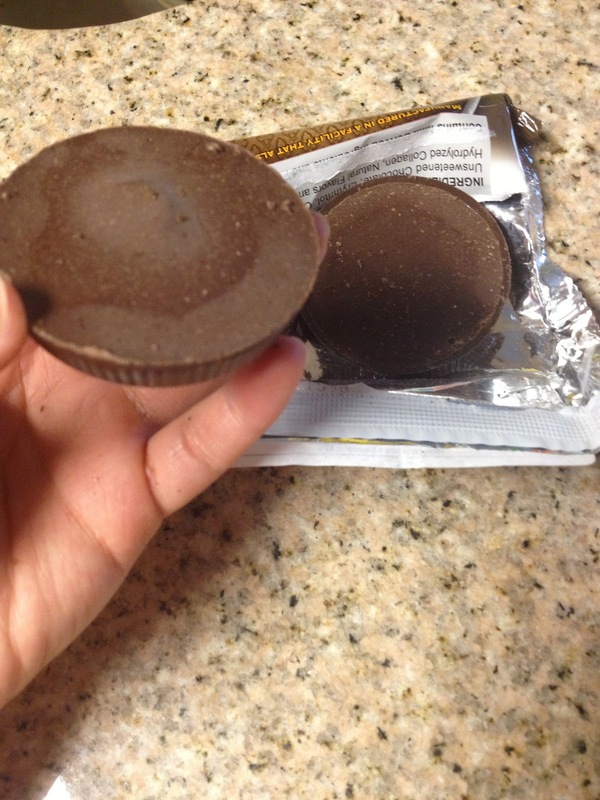 Can I say they taste almost EXACTLY the same as Reese's Cups?! But with a bunch of nutrition and protein and without all the nasty unhealthiness! 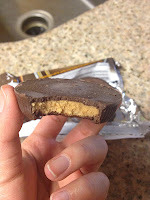 The peanut butter part was my favorite of course :] And the chocolate part didn't taste just like the Reese's chocolate, it had sort of a thicker flavor, yes I just gave "flavor" and adjective that isn't usually used to describe a flavor. There was like a thick darkness taste, not the taste of white or milk chocolate, but not completely bitter as dark chocolate. It was a perfect combination. And the peanut butter kinda gets stuck to your teeth and to the top of the roof of your mouth! Hehe I kinda like it because I can save some for later.. :P just kidding. 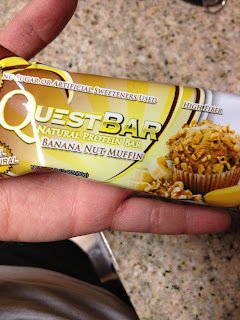 I hate to be boring.... but this LITERALLY tasted just like a Banana Nut Muffin! I'm SERIOUS. 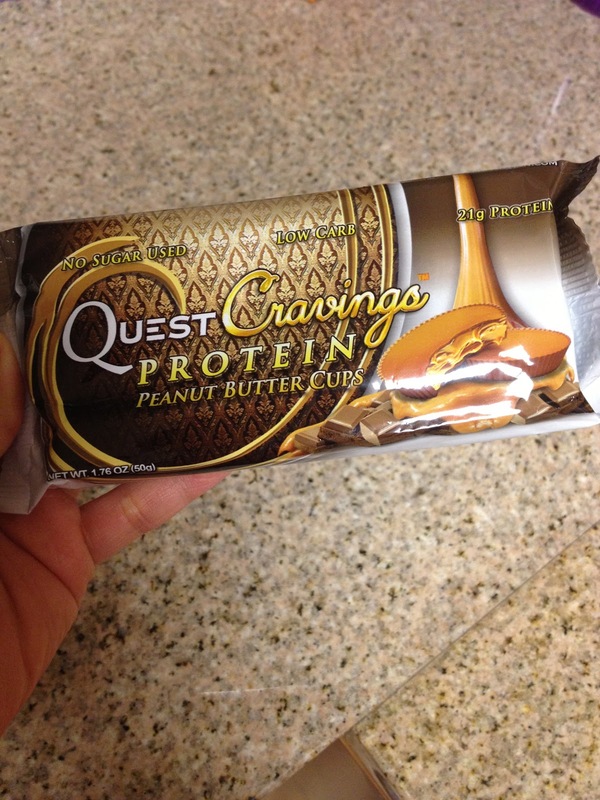 There's just no other way to describe it than by telling you it tastes JUST LIKE the wrapper says! Imagine any banana bread you've had with nuts and crunchiness inside and THIS IS EXACTLY like that. But SOOOOO much healthier! 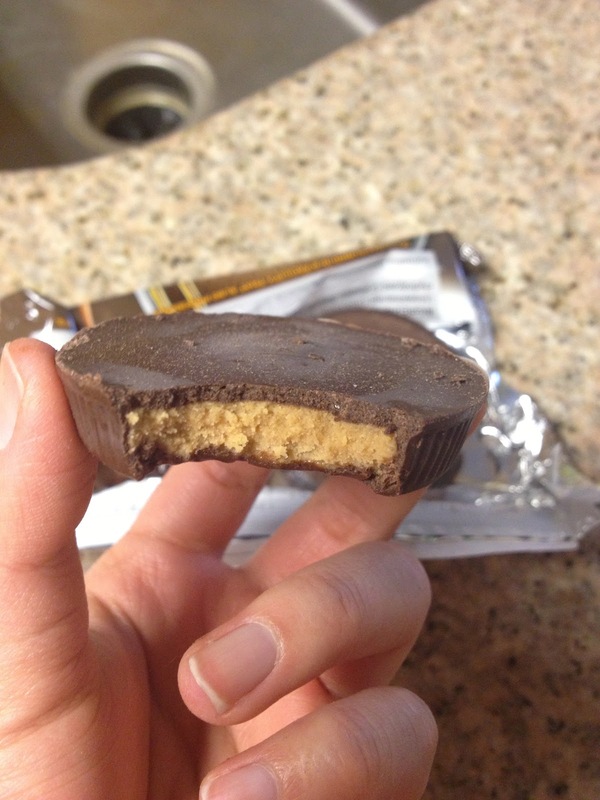 It's got real nuts inside and the crunch adds such great texture! And usually, I hate artificially flavored banana products because they never end up tasting "right" or like genuine banana. They're always either too sweet, or too MUCH banana, which makes it taste ... eckkk. But this?!?! RIGHT ON THE MONEY! DELICIOUS DELICIOUS DELICIOUS. SS means Superset! So do that exercise right after the first one with no rest! And TS is just triple set! All of the ones that can be done with weights, DO IT HEAVYYYY! Burn those cals #fitfam! If you don't know any of the moves, try googling them and they should come up! For the kickback and tricep dips, that's a glute cable kickback! The last exercise is pretty self explanatory! Squat down, then get up, bicep curl, and then shoulder press! I also added to the last one to make it a triple set, some deadlifts! 3x12! You basically step one foot up on the bench, then the other, and then skip back down, really fast! The step up skips are steps 1-5! Get that heart rate up! Enjoy! Let me know how you did! In general, the RAI treatment for GD is recommended for older individuals, because (regardless of what doctors are saying) there is number of people who had RAI at their 20es developed nodules 2o years later. Therefore it is very important to select the right dose for the treatment. The short term side effects include damage to salivary glands (rare) and thyroid inflammation. Large goiter requires higher dosage than small one; also, if thyroid eye disease is present RAI makes it worse. I assume that your GD was confirmed by high level of TSI antibodies in your blood (there are some other hyperthyroid conditions (thyroiditis and toxic nodule) that are treated differently. Quest Bars are SO good!!! 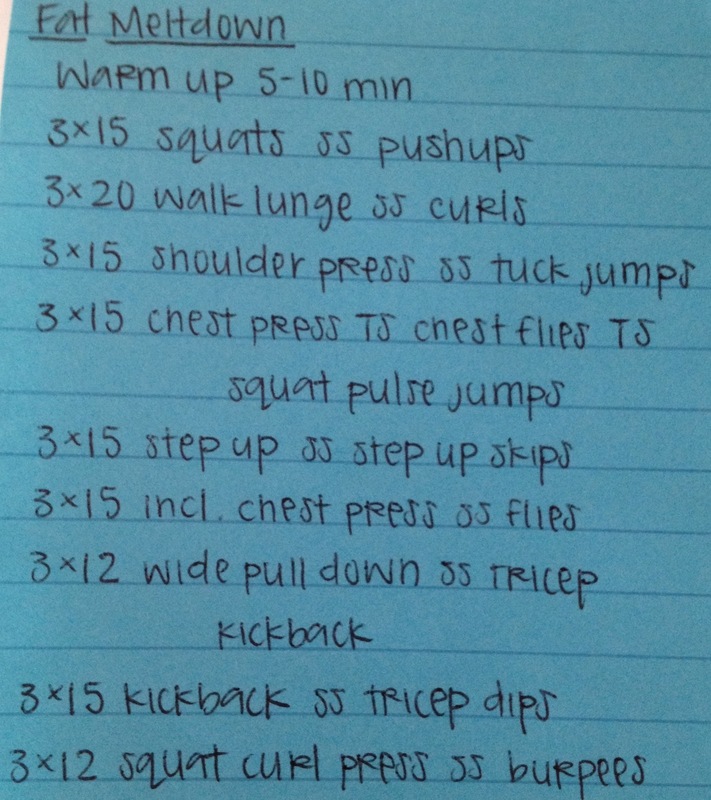 :) Great workout post! 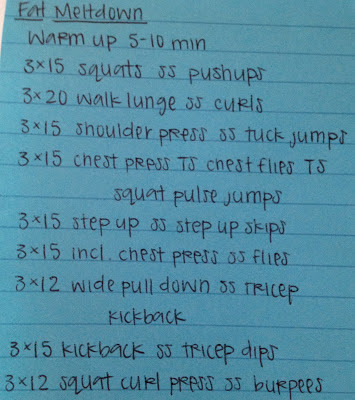 Do you do the workouts one time all the way through or complete each workout 3x before you move onto the next one?